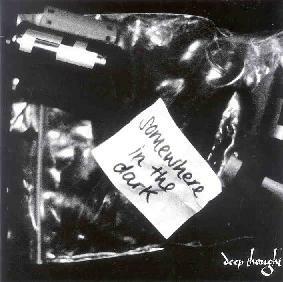 Deep Thought - "Somewhere In The Dark"
Martin Altenbach (drums), Pat Merz (vocals), Marcel Oehler (guitars), Dominik Pfleghaar (keys), Dominik Rudmann (bass). Modern progressive in a Genesis/Marillion mold, called neo-prog by many. This release features nice long instrumental passages with good interplay between synth and guitar. Marcel tends to go for an edgy distorted guitar sound, but since it’s not mixed to the very front, it works well. Dominik does both the washes and some very tasty synth runs. The synth sounds tend to be more analog sounding. The vocals a bit restrained, almost thin with no power. For me it’s the weakest part of this group. It almost seems like Pat is never truly involved in the songs. There are 4 tracks over 10 min and each track seems to features at least some type of instrumental. For more information you can visit the Deep Thought web site at: http://www.deepthought.ch. Somewhere In The Dark is distributed by Galileo Records. You can visit their web site at: http://www.galileo-records.com. Contact via snail mail at: Galileo Records; c/o Patrick Becker; Alpenstrasse 22; 2540 Grenchen; Switzerland.